Last edited by Dibya on Tue Jan 03, 2017 1:01 am, edited 14 times in total. This patch is only for the English language or can also be used for other languages (i.e. Italian)? It should work.First intrigate U_H or Onepiece updatepack then intrigate this one. Hi Dibya. Can you fix it for another language? i upload the files you need. master2 wrote: Hi Dibya. Can you fix it for another language? i upload the files you need. master2 , I will make please try it in VirtualBox or any vm please . PLease give me some time . Next sunday I will upload OK. I have fixed some problem with usb dongles, I will also include those thanks. I have one question , which language does this files are? master2 , are those files are rus . Hello , thoose files are already patched with patcher or not? If not i will patch no problem. Last edited by Dibya on Tue Dec 29, 2015 12:15 pm, edited 1 time in total. Do not worry ,I will make a video. Thanks for kindly providing me all information ,I will patch those this saturday and then upload it for you and other greak guys/gals. I think it is localization isue. With this file in test on virtual box (xp english sp3 pro) set ram 4gb. after install, i have dual boot (normal and xp64g). in properties ram is again 3.5gb. Dibya after your test what ram do you have in properties? My Xp Sp3 with this patch is about 8.71 gb out of my (8+2)gb DDR3 Ram. I think VM is using ntoskrnl instead of ntkrlpa which is causing this problem. This the screanshot of pc with this patch. 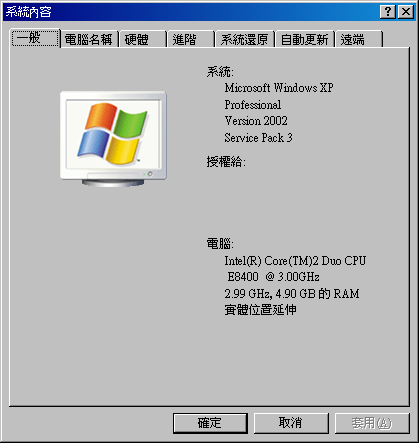 master2 wrote: With this file in test on virtual box (xp english sp3 pro) set ram 4gb. after install, i have dual boot (normal and xp64g). in properties ram is again 3.5gb. Dibya after your test what ram do you have in properties? Sorry , I have failled patching your localized files as offsets of much different than english.Please wait ,this sunday I will give you final answer please wait .I have updated this patch now please try it once please .I have today formated my mother laptop with this patch , WinXP detected 5.67 out of 6Gb so please increase it more than 4gb in vm then please try again . now it should work sorry previously ,I have not mentioned this lines. Now,I have fixed lot of hardware related problem. new version coming with creative driveraudio driver fix . Dibya wrote: new version coming with creative driveraudio driver fix . Trenchboygun wrote: where is dl link? He's working on a new release... Be patient. My exams are going on . So please be patient. But i dont see any download link....sooo was the update to simply REMOVE something in the OP? @Skrell my friend monday or tuesday you will have something new. Dibya wrote: @Skrell my friend monday or tuesday you will have something new. Someone had mentioned, that it will actually make the PC seem/feel slower, or possibly more latency, while using these patches. So, to you all using this, what does it FEEL like? brother this depends on pc hardware architectures. In my case improved my performance regards to 3D Accilaration. Can someone please run some meaningful benchmarks to see if there's any real-world benefit? NO other addons included for the test. My Original ISO is XP Pro SP3. Any body can please test this addon in vm .